In conjunction with TCNJ’s two-day workshop, Mind, Music, and Invention: Creativity at the Intersection of Music and Computation, an exhibition of artifacts from The Sarnoff Collection related to the history of electronic music was presented in the lobby of the Music Building. Below are a selection of texts and images from that exhibition. A 1930 advertisement for the RCA theremin shows how “simple and graceful movements” could be transformed into electronic music. Although inventors had explored the electrical production of sounds since the mid-19th century, the pace of research accelerated following the invention of the vacuum tube. As a leading producer of vacuum tubes, RCA took an early interest in electronic music. In 1928, the corporation purchased the rights to commercialize the theremin, the first gesture-controlled electronic musical instrument. Subsequent advances in electronic computing inspired personnel at RCA’s Princeton laboratory to construct an electronic music synthesizer, which read notes off a pre-punched paper reel. By the 1970s, the bulky vacuum tubes utilized in both the theremin and the Electronic Music Synthesizer gave way to transistors and microprocessors. Using devices like the COSMAC-VIP, one could program musical selections directly into a computer’s memory. The Sarnoff Collection is currently being organized, cataloged, and photographed for presentation on the Internet slated for launch in summer 2012. TCNJ classes will be able to access the collection by next fall. Along with this exhibition, there will be a display in TCNJ’s library, opening on April 12 to commemorate the centennial of the Titanic disaster and David Sarnoff’s role as one of the telegraph operators who coordinated the rescue effort. In 1920, Lev Sergeyvich Termen (Theremin), while working at the Physico-Technical Institute in Petrograd (St. Petersburg), developed a “radio watchman,” a burglar alarm triggered when an intruder disrupted the high-frequency waves emanating from a transmitter. Termen later refined this device, adding an oscillating circuit that generated an audible tone whose pitch changed depending upon an individual’s proximity. He soon realized that his creation might serve as the basis for a musical instrument, with a vertical antenna controlling the pitch and a horizontal loop modulating the volume. Originally referred to as the “etherphone,” the public would later name the device the “theremin” in honor of its inventor. The device shown here was built by former RCA technician Jim Haldeman. 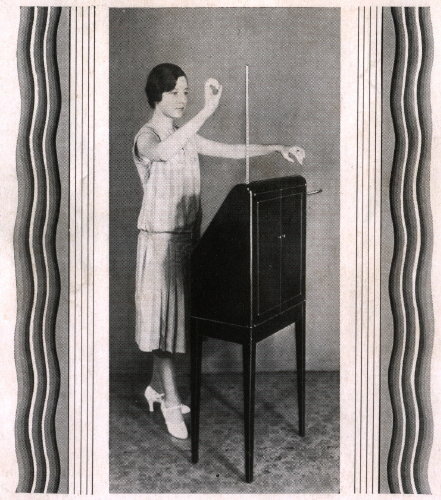 With its unearthly tone and unusual performance technique, the theremin quickly captured the public’s imagination. (It remains the only instrument that one can play without touching.) RCA saw the instrument as another means of bringing music into people’s living rooms, and the company bought the rights to commercialize the device. At concerts like the one discussed in this 1930 article, RCA described the theremin as a “modern instrument” capable of producing music “unlike anything ever heard before.” Despite these assurances, RCA only sold 500 theremins, of which half are believed to still exist. During the 1950s, electrical engineers at RCA’s Princeton laboratories returned to the question of electronic music generation. 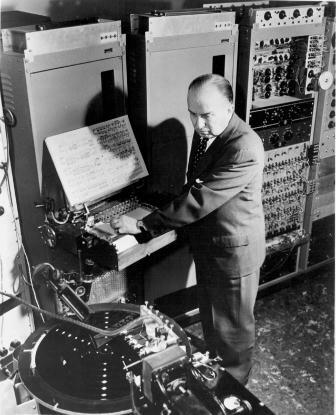 Building upon recent advances in communication theory and acoustical research, Harry Olson and Herbert Belar constructed the RCA Electronic Music Synthesizer. An updated version of the RCA Synthesizer, known as the Mark II, was loaned to Columbia University, where it remains to this day. The development of microprocessors, integrated circuits that combined the logic and memory systems of a computer’s central processing unit on a single chip, opened up new possibilities in electronic music production. Although RCA stopped selling computers to other businesses in 1971, it continued to produce low-power CMOS (Complementary Metal-Oxide-Semiconductor) integrated circuits. 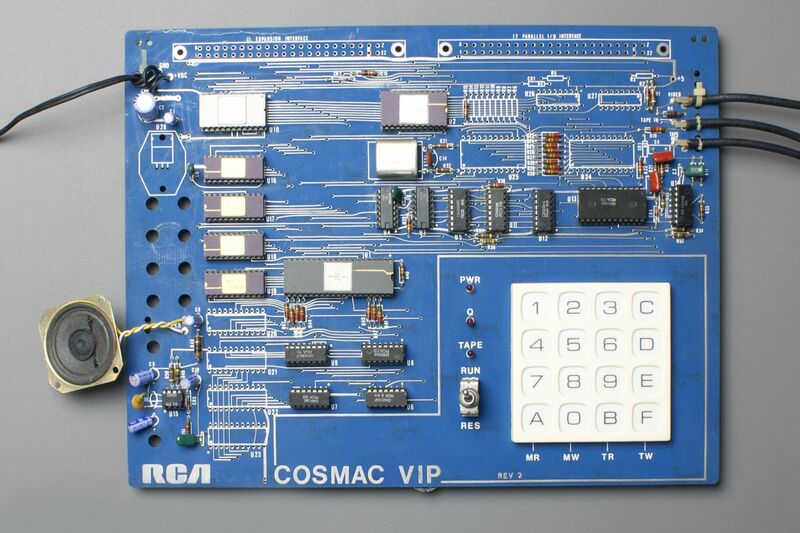 One of these formed the core of the COSMAC-VIP, a computer intended for home users. Developed by engineer Joseph Weisbecker, the VIP was sold as a kit for $275. After hooking the system up to a television, users entered programs using a 16-button keypad. The VIP also contained audio circuitry, permitting users to add music or sounds to the games they designed. Joseph Weisbecker and his RCA colleagues had an opportunity to show off the COSMAC-VIP’s musical capabilities in August 1978 at the First Philadelphia Computer Music Festival. Organized by members of the Philadelphia Area Computer Society, this concert was among the first to feature music synthesized using personal computer systems. The RCA team opened the show using a COSMAC program that Weisbecker developed called PIN-8 (“Play it Now”) to present renditions of the Mexican Hat Dance and Scott Joplin’s Maple Leaf Rag, along with selections from Bach and the Beatles. These performances, preserved on the phonograph record seen here, provided early confirmation of the transformative effect of microelectronics on musical composition.